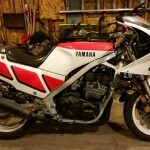 Picked up this 1987 Yamaha FZ600 recently and it’s sat for years, just doing some basic restoration and I ran into a little bit of trouble pulling the oil filter. The bolt rounded off when I was using an impact driver to try and remove it. Did some googling and it sounds to be a pretty common problem. I tried a couple of things and here’s what I came up with for a solution.